Australia produces some of the best magazines in the world, and one of my favourite Aussie mags is Inside Out. This shelter mag covers all the bases - gorgeous interiors, homewares trends, and cool products and the good folks at Inside Out just wrote to let me know that they have launched their new blog. You'll find lots of behind-the-scenes home decorating info from people in the know. And a huge thank you too for choosing me as one of their 'favourite bloggers'! The team also sent me a very cool hemp handbag organiser (a neat little drawstring bag to put all your essentials in and then pop inside your handbag - no more lost phone/keys/lipsitck!). The hip bag graphic is designed by Grace Lee (who is definitely an artist to watch - see the Inside Out blog for more details), in collaboration with Bee & Apple (who I profiled a few weeks ago here). 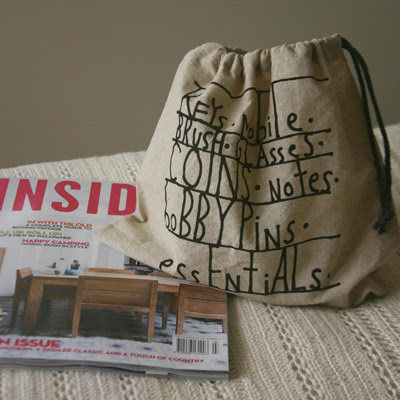 The bag is a gift-with-purchase with the May/June 2009 Inside Out magazine on sale from 1st April. Enjoy! Inside Out has a fantastic blog, thanks for sending me there! I knew I couldn't resist checking it out when I saw a Charley Harper illustration. Thanks Steph for your sweet and lovely blog post. How lucky of us to have the Bondville spotlight shine on Inside Out. I love your styled shot of the bag and issue, too! PS. Also smitten with the Blossom stamps you mentioned a while back. Too cute. Oh yay! One of my many fave mags. Thanks for the pointer Steph! Hi Anna and The Cottage Cheese - so glad you like! Oh Lee - I'm so flattered. Thank you! And another blog to follow, hooray! 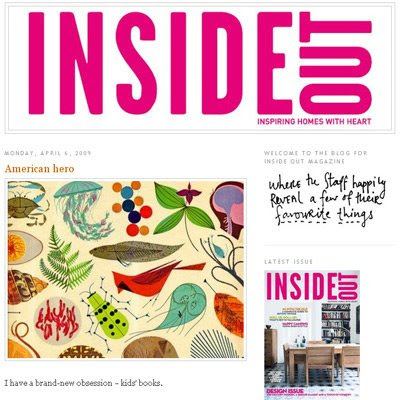 I'm also becoming a magazine junkie, Inside Out is one of my favourites too. Thanks Kathryn! I love coming back from overseas and seeing all our lovely glossy mags at the airport newsagent. I don't think we realise how lucky we are to have so many great publications, all shiny and stylish. Ooooh, another great blog to follow. I love Inside out mag too It's one of my 6 mags I allow myself a month. I love this blog, thanks for sharing all that you do. Oh thank you Kelly! You are so kind. And I'm drooling over the great competition that you are hosting on your site at the moment! I just found Inside Out blog and love it! your blog is fantastic too, I found it through Holly':) I like the feature you used to link your related posts. It works really well here! Thank you so much! I'm also grateful for your thoughts on the site layout; sometimes you can get too close to your own projects and it's great to get a new perspective.